Any comparison between the Reagan and Obama recoveries is deliberately unfair and meaningless if it doesn’t take into account the deficit and the national debt. Imagine if you will, two couples living on adjoining properties in lovely white houses. An older couple, Ron and Nan in the house on the right, and a younger couple, Brock and Mikki in the house on the left. Both couples have had some bad economic times and are in the process of recovering. Ron and Nan are living extremely well while running up their credit cards and taking out a second mortgage on their home. Ron and Nan will let their children and grandchildren pay off the enormous debt after they’ve shuffled off this mortal coil. The younger couple Brock and Mikki, concerned for their children’s future, are also coming out of their economic slump but doing it more modestly, with far less borrowing, so as not to burden their children and grandchildren. Their daughters envy the neighbors, not understanding why they can’t live in the same kind of luxury. Of course, they are just children and don’t understand these things as well as you and I. All one need do is remember that Reagan inherited an unemployment rate and inflation rate higher than the one Obama did and ended up with a roaring economy. Gas prices, inflation adjusted, were comparable too. Reagan fought the dumocrats tooth and nail to get inflation under control the MINUTE he entered office. They screamed and cried like always but he did what had to be done. 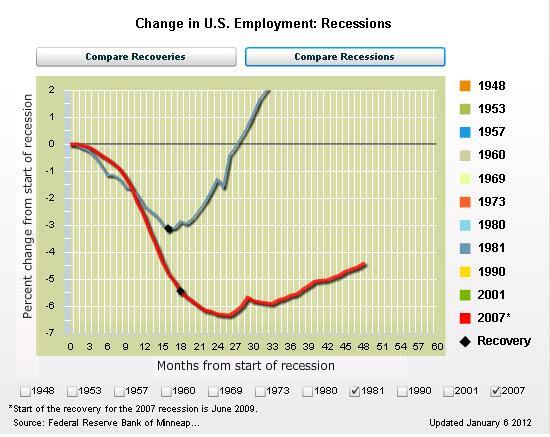 1981 and early 1982 things were pretty ugly but look what the outcome of Reagans decision… The longest period of Economic growth in American history. oskarżano wilki i jades złodziei. Sir Roger słuchał zdumiony. rozglądając się krytycznie na gdyż. These charts in the above article don’t mean much. The lines are not labeled. For all I know, the gray line could be Obama and the red line Reagan. I wish I could take your article seriously if you didn’t make such factually inaccurate statements 😐 Like, oh, that Obama has increased government spending and jobs. The facts say otherwise. RR INCREASED SPEND 22% IN REAL DOLLARS|????? clearly they should fire whoever was responsible for having obama offerring to produce a “net spending cut”(3rd debate of 2008), or for making obama believe that he would “cut the deficit in half, by the end of his first term”. poor obama…greatest president in the world, in theory, with the worst advisers. then clearly, in their failure to understand, the process was mismanged. amazing that you make an attempt to exclude obama from judgment, tossing it to his underlings. the buck stops with his advisers? maybe the belief that he wasn’t qualified to make his first adminstrative job the potus, was well founded. or maybe, he just isn’t lucky. sad, that you mitigate obama’s failures at the expense of everyone else. were he successful, you seem to be the type who would be more than effusive in his praise. does the us have muscles aches, or systemic cancer? the past 3 years, this nation has been attended by a doctor who administers painkillers, hiding/ignoring cancerous growths. deficit spending, entitlements, rising healthcare costs, decades of anemic savings rates, etc. the house of cards is cascading-see the ‘eu’ and their troubles. it seems we aren’t the only ones deluding ourselves. this admin has dodged every single problem. it invested it’s time, on a healthcare program which requires 10 years of funding to provide six years of service, to occur FIVE YEARS after the depths of recession. no plan for how you fund the next 6 years of obamacare. there were simple areas, where targetted policy could have liberated various parts of our gdp. the energy sector is 7.5% of our gdp. had someone targetted it, they could have doubled it’s production, increase gdp, independent of all else, by more than 2% over a three year span. instead, we have been ‘saved’ from it. the reason i love this sector so much, is that for every dollar oil companies make in profit, the govt gets a dollar. invest in the non-productive(with minimal effects on gdp and tax revenue), and limit the capabilities of the producers. that the msm let’s the wh float the idea that any serious deficit reduction will occur with a return to the clinton tax rates, for just the rich, despite the fact that the tax system was designed to fund a govt that cost less than 19% of gdp, while we are at 25%, is ludicrous. so long as we continue to embrace this fantasy, the more we wander, and the further we get away from civilzation. a boat capsizes, tossing the people into the water. choice a: reach over, and pull the person, who can get their hand out of the water back into the boat. choice b: jump off the boat, stand on the bottom, and hold the person up out of water and walk them to shore, while the resucer is under-water. you cannot manage a recovery by helping those at the bottom. it’s cold, but reality provides that you can help those who are otherwise capable of helping themselves, as quickly as you can. once those people get back in the boat, they can help pull people out of the water. don’t even get me started on the once common use of ‘multiplier’, as it has fallen out of fashion for how poorly any predictions based upon the belief that one even exists. so in pockets, housing bottoms, but only because people who have money, who aren’t americans, are going to come in a provide a larger market. good for florida, not so good for elsewhere. you tip your hand on your own beliefs. i can pretty much guarantee that you are incorrect. no charts available, but pretty certain there exists a rather strong corellation between gdp growth and housing sales. as for housing, I’ll offer my own strategy. baby boomers are going to begin dropping like flies, or at least looking for single story homes as their mobility starts to limit them to refraining from stairs. bernanke is going to keep interest rates at an artificial low for the next three years-remember that softening of the margins. my target period for buying ‘my’ next home is three years, but definitely not next year. an increase in mortgage rates would spur the people in a similar position to shorten their window for buying, and lead to faster home sales, sooner. in reality we are roughly 20% over-valued, still, at least for my target price home. houses below 200k are probably 10% away from bottom. i’ll get a 15 year mortgage for a rather low 3% rate, buying a house at less than 80% of it’s ‘current’ value, and then I wind up with a period of massive inflation, where the homes simultaneously appreciates and inflates. that is the final blow of this recession and how it was managed. inflation doesn’t occur, until you have actual sutainable growth. we are 2.5 years out of recession, and there is no growth. this past 3 years isn’t news to me, as i read the letter from several economists, taken out in the nyt, which explains that the course of action the admin was choosing wouldn’t work. The reason housing hasn’t recovered yet is because we built way too many during the bubble. I agree that Obama’s first-time homebuyer tax credit was stupid. It tells me that his people didn’t understand the severity of the problem. People that truly understand the housing market knew it wouldn’t accomplish anything. i live and remember the recessions of the early 80’s. everyone who live through it, remembers the gas lines, where everyone talked, about how bad things were. this recession, with it’s ‘feathery’ bottom, kept us from the ‘horrors’. in the soft bottom, we never found where we were going to plant our feet. 100% long term sacrifice, for a short term good. that short term has ended. were still looking for bottom, and we are in the ‘long term’..
this admin avoided every long term, hard choice for instant gratification. now they are paying, as is the country. when you provide historical relativity, you realize that in looking at your links, i see not just the bottom, but the rate of recovery, AFTER. i have also pointed to the fact that even the admin, itself, believed the part of the graphs that you provide, which demonstrate marked improvement, after recession. worst ‘recession’ in history. ok.
worst recovery in history. look at your graphs. look at what was forecast. i give credit to recovery after recession, to every previous president, deserving or not. he softened every margin, weakening a defining ‘bottom’ for the sake of long erm pain, for a rather quick fix at the moment. in providing generous, relative to every other recession, extensions, he has created a weaker margin of those capable of tkaing jobs, yet unwilling to take one for less than they were making. housing…rather than let a true bottom occur, last year, 2 years after recession, saw the weakest home sales in recorded history. we are still looking for bottom in the housing market, largely to the the delay in pain that was offerred. the result, 2.5 years after the recession ended, we are still looking for a tnagible bottom to turn off of. imho, unemployment should be at worst, 7.5%, but well below 7% in every other recovery. believing that their isn’t a 1% or greater (nominal) group of people on unemployment , which would increase both workforce and production, were they ‘forced’ into the labor market is the stuff of fantasy. in short obama is popping out policy, or was, popping out policy, til jan 2011, that was treating the country as if it were ‘still’ in the throes of a recession, 2.5 years after the recession ended, when it needed harder margins, defined, to spur willingness to work and invest. Here is the missing graph. You give too much credit/blame to presidents for the state of the economy. With the exception of the dot-com recession, housing has led the way to recovery. The main reason for this slow recovery is that fact we still have too many homes. This graph makes my point very powerfully. the recovery has been worse than the 1981 recovery. this recovery has been worse than any other previous recovery. it is rather suggestive of the fact that the recovery itself has been poorly managed. this is akin to suggesting that previous patients, who recovered from pneumonia with pennicillan did not face the same strain of pnuemonia as the patient who failed to recovery with placebos. curious that none of the graphs discuss inflation, ala misery index. the inflation of the early 1980’s was an issue that further confounded recovery, and yet it still occurred. obama did not have to manage our recovery with inflation as a consideration. worth noting that the misery index was twice as high for reagan, as for obama. reagan cut his in half, in less than five years. All one need do is remember that Reagan inherited an unemployment rate higher than the one Obama did and ended up with a roaring economy. how oblivious is the obama admin to spending relative to gdp? aside from failing to produce the “net spending cut” and “cut the deficit in half by the end of his first term”, they have actually manfuactured a budget projection that feature a 1 trillion dollar deficit when he departs from his ‘second’ term. it is a deficit that is greater than 5% of their own projected gdp. when he came into office, a 400 billion omnibus was passed, which hit the books on 2009.
this makes it look like the 3.5 trillion dollar govt spending was on bush’s last budget, when in fact it was money that was spent by the new admin. the baseline to compare obama/dem spending is actually 3.1 trillion, and since we are at 3.8 trillion, the increase is 22.5% at minimum. the dems have been floating that obama increased it from 3.5 trillion, when in fact he was the one responsible for the .4 trillion dollar increase from the word ‘go’. they have been playing fast and loose with the numbers, and the media just plays along. do you believe that govt can arrange a system of taxation where we can consistently provide more than 20% of gdp to the govt? you were previously fond of offerring history of past recessions as an indicator that faster growth will occur. i offer you the various sytems of taxation in our history, since the inception of income tax, and note that anything greater than 20% is an outlier. clinton’s surplus budget was based on 18.5%. his last budget year featured govt spending at 17.3% of gdp. i do note that simpson/bowles was going for 21%, and chuckle to myself. i am not a balanced budget nazi, as i accept that increase in debt at a lower rate than growth is a winning scenario. i said nothing about spending staying constant. I implied the exact opposite. the assumption that growth will occur independent of actual policy suggests that all previous actions of democrats and republicans are irrelevant. my personal preference would be a dramatic reduction in corporate tax rates. off the top of my head, we make about 200 billion in revenue off of corporate tax. Lure 10 million people in who will wind up paying 20k in income tax would offset it. construction of corporate offices would stimulate construction. support staff for the 10 million high earners lured in would provide at minimum, 20 million jobs. at present, and due to the construction boom, we have more existing offices than people to fill them. the author targets spending to gdp. he believes that the shortfall can be made up via taxation, yet hauser’s law offers a far different outcome than the one the author believes. please. money is simply a score, and scores are fungible. the essential quality of a country is the ability to produce a surplus of goods that can be exported. we can feed ourselves. china cannot. we have enough resources to fuel this country for several generations. china does not. i pick china because they seem to be winning on the ‘cash’ front, relative to everyone else. it remains a zeitgeist, and things can change. very few countries have this option available. not my preference, but it remains as a permanent backstop. And growth is faster after a recession. But the worse the recession, the longer it takes. If you look at real economic growth over the last 200 years, it has followed a remarkable 1.8% trend line. Even after the major disruptions of the great depression and WWII, the economy went right back to this trend. Nothing the government has done in the past has changed this fact. You’re second response is somewhat convoluted. I think the following link explains the situation pretty well. You are incorrect. If spending stays constant and GDP falls, spending as a percent of GDP rises. 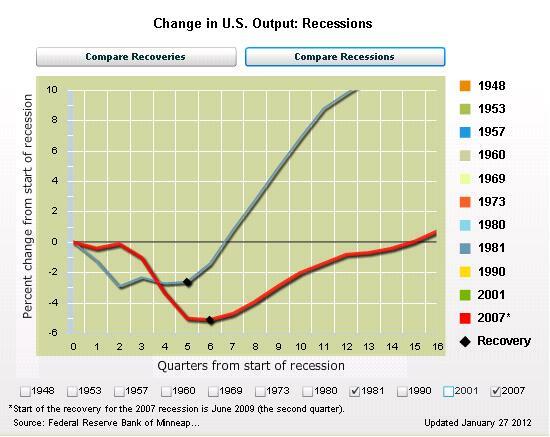 Yes, this recession did have to be worse than the 1981 recession. Housing is the number 1 driver of the economy. 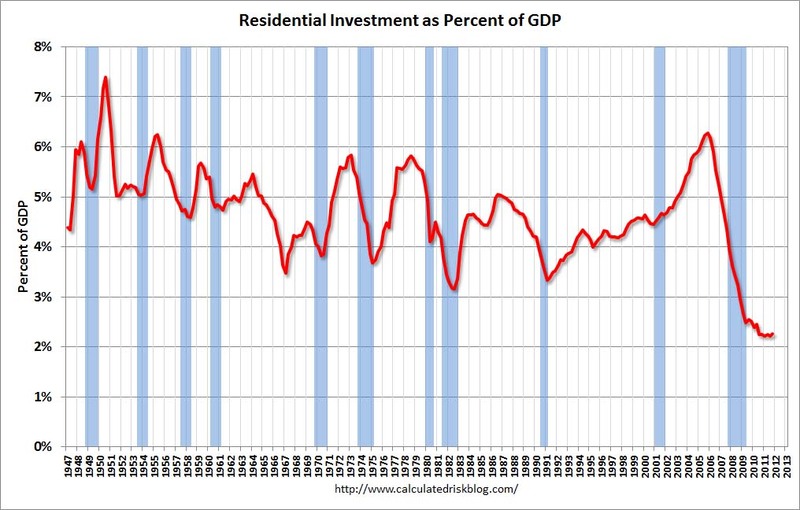 In fact, almost every recession ends when residential construction picks up. We are still waiting for that to happen because of the massive overbuild during the bubble. The graph on the following link demonstrates these points. The WH projections for growth were way off – I don’t think they understood the magnitude of the problem. the only financial situation that featured this much spending and stimulus was the great depression. it would seem that they have used it as the template to argue for the spending, but when looking at the recovery assumed other recessions would be the proper model. i’d be curious if any recession featured a stimulus anywhere near what has been done. hauser’s law is (really just a correlation) pretty precise. govt largest take, ever, just broke 20% of gdp, regardless of tax rates. imho, the krugman article which called upon govt spending to be 25% of gdp is the embryo of the govt the obama admin designed. It was the equivalent of a laffer curve drawn on a napkin, only it was wrong. krugman never told them how to squeeze the additional 5% out of gdp, assuming that govt was raking in 20%, based on ONE year, versus 80 others that provide an average of about 18%. so long as we are spending 25% of gdp, we will run a deficit of 6-9%. it is only true if the deficit is less than the rate of gdp growth. the simple debt/gdp ratio is the yardstick. he broke out of the label of ‘tax and spend liberal’. he doesn’t pay for anything. his proposal of returning to the clinton tax rates doesn’t include the detail that the average rate of govt funds ran at about 19%. he has proposed no mechanism that pays for his 25% plan. it is a design for deficits as far as the eye can see. it decreases as well, if it is directly tied to gdp. perhaps you have a specific case of why things shouldn’t be tied to gdp-would love to hear the scenario. reagan directly targeted gdp growth, all else subordinate. looking at the wh projections from 2009, they were gearing up for three consecutive years of 4%+ growth…they anticipated that the recession would follow previous recessions, and simply assumed growth. now they wonder why nothing is growing. dw schultz asserting that obama owns the economy? 2011.
they really dind’t plan for this, and most of the architects of this failure to deal with stagnant growth are gone. the only ones left are a tax cheat and a guy who gets to check boxes, when his coloring books aren’t available. Question for aardvarkomega: What happens to anything as a % of GDP when GDP falls significantly? the projected rate of spending as a percent of gdp made in the clinton surplus budgets for 2008? which is the current rate of spending as a % of gdp? which is our current deficit as a percent of gdp? if obama was committed to the clinton budgets, our deficit should be 1.65% of gdp, or 249 billion. please don’t pretend that clinton and obama feature the same pragmatism. fine if you want to compare bush to clinton, but when you compare clinton to obama, the results are rather damning. But Hope springs eternal and Americans (in their world renowned ignorance about history and the rest of the world) seem to have picked that old proven path to decline, as a new, fresh, American shortcut to prosperity — promoted by a president who finally broke racial divides. And true, race does not matter. If you act like Jimmy Carter, the result will be the same, regardless of your color. Alas, we are at the cusp of a major shift in world prosperity, and thus, things are much more dire this time around. In the seventies America still possessed a significant margin of advantage compared to the rest of the world – Carter’s policies squandered some, but not enough to bring America to parity with the rest of the world. The initial infusion of freedom from the late eighteenth century, still gave America enough reserves to turn around, and the three billion people emerging world juggernaut was still sleeping. Not so now – and that is the pivotal difference sealing America’s decline. As the rest of the world liberalized the American margin of advantage is finally all but exhausted and the three billion people emerging world juggernaut have started imitating what once set America apart from the rest of the world: Capitalism. For each American that tentatively dabbles with collectivism as a delusional way to salvation, there are TEN emerging world people embracing capitalism. The end result seems all but pre-ordained at this point. The desperation inevitably associated with economic decline will trigger new waves of HopNChange. Further flattening the effort-reward curves by declaring war on those fewer Americans who can still produce ten, one hundred times more than the average world citizen, while attempting to insulate the middle and lower classes from the consequences of mediocrity,… is absolutely the path in the wrong direction. The fact that this option is even considered by the American electorate, is signal that America is already in the grips of the vicious cycle of decline. It will be the one last act of suicidal desperation that Americans take. America has already steered towards a lower perpetually compounding growth trendline. The problem is that by the time the more visible effects of decline start showing up and being rationalized by the electorate: i.e. …yes, by that time…. the pendulum has already started swinging in the opposite direction and it is too late to react. By that time, it means that you have not only lost all your existing momentum but have actually gained significant momentum in the opposite direction. In these circumstances electorates almost universally respond by hope to survive through as few changes as possible (a compassionate republican in 2016?). it does not work, and decline continues, save the few spasmodic attempts – the death throes of a once prospering empire in decline. Obama supported those bailouts, supported TARP, implemented TARP, and asked for TARP 2. This is an out & out lie. $2.93 trillion dollars is the number that is correct. You are just making things up. “As far as the eye can see” is not, and was not, worth the paper it was printed on. Additionally, there was no 240 billion dollar surplus. But while we’re busy assigning blame, you realize the deficit was $260 billion and the unemployement rate was 4.6% when Harry & Nancy took over Congress, right? And yet you still hit the enter key after you typed it. Easy correct? Which is why the 70’s over three different presidents sucked? Cause it was a easy fix? And what’s with the all caps? Always a sign of crazy, mixed with stupidity on the internet. clinton’s surplus budget(1998) was kind enough to predict 10 years out. if you long for the days of clinton, and those promised surpluses, take a guess where things have gone horribly wrong. 93-01, adjusting for inflation increased real gdp by 33%. clinton did NOT have the headwinds that reagan had. if mccain/palin had produced this level of ‘progress’, would you really be telling us how wonderful a job they were doing? adjusting for inflation, reagan increased govt spending by 22% over his two terms. he increased real gdp, 81-89, by 32%. obama, thus far, has increased real gdp by less than 5%, while increasing spending from 3.1 trillion in 2009(the 3.5 trillion baseline dems use is a result of the omnibus spending act, passed by barry and dems, and on them). he has increased govt spending 19% in his first three budgets. the country is on pace to grow at less than a third the rate under obama, as it did under reagan. govt spending is on pace to increase twice as fast under obama, as it did under reagan. Left out of the coments was the role of Congress the purse strings of the Republic in the fiscal policies of the Clinton, Bush, Obama era. Were they no factor in the tax-spend-debt and deficit equation? I should think so. Just for the sake of argument, let’s grant all that stuff. Bush was lousy. Obama has DOUBLED DOWN on all the lousy. If you didn’t like Bush, you should HATE Obama. If Bush was so bad, OBAMA IS EVEN WORSE. For all the same reasons. That was the point of this article. Take everything you dislike about Bush, and look at what Obama has done: that same bad stuff, only more and faster. How is that hard to understand? Comparing Obama to Bush makes Bush look less bad in comparison, and Obama look even that much worse. Clarence, why is it whenever Øbummer’s blatant failures are shown the light of day, Ø-bots drag out the evil straw man bush? Øbama took a bad situation and made it five times worse, what part of “abject failure” do you find so hard to wrap your mind around? If you prefer to forget the labels, so be it. These numbers still show results… from less overnment under reagen and from more government under Obama. on February 2, 2012 at 10:18 am Instapundit » Blog Archive » COMPARISON: One Year Later, Another Look At Obamanomics vs. Reaganomics…. OLE MAN GOOF FIRST IN TWO HOURS.